Map of the Ziyarid dynasty, lighter blue shows their greatest extent for a small period of time. 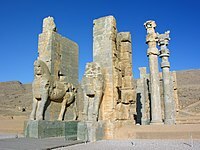 The Ziyarid dynasty (Persian : زیاریان‎) was an Iranian dynasty of Gilaki origin that ruled Tabaristan from 930 to 1090. At its greatest extent, it ruled much of present-day western and northern Iran. The dynasty was descended from Vardanshah, leader of the Shahanshahvand tribe, which traced its descent back to the legendary king Arghush Farhadan, who was the ruler of Gilan, and lived during the time of Kai Khosrow. Vardanshah had a son named Ziyar, who married a sister of the Gilaki king Harusindan, who bore him a son named Mardavij. Mardavij later served another Gilaki military leader named Asfar ibn Shiruya, but later betrayed the latter and conquered Tabaristan, which led to the foundation of the Ziyarid dynasty, which he named after his father. Shahanshahvand was the name of a royal Gilite clan roaming in Dakhel, Iran. A member of the clan, Lili ibn al-Nu'man, ruled as the King of the Gilites in the early 10th-century until he was killed in 921 in a battle with the Samanids. Arghush Farhadan was a legendary king of Gilan, who lived during the time of the Kayanian king of Iran, Kay Khosrow. He was one of the commanders of the latter during the war against the Turanian king Afrasiab, and along with Gostaham, invaded Khwarazm and defeated Afrasiab's brother, Garsivaz, and his son, Sheda. Harusindan was the third king of the Gilites, ruling briefly in 921. He was the son of Tirdadh, who was the first king of the Gilites during the 10th century, but later died and was succeeded by another Gilite named Lili ibn al-Nu'man, who was from another clan. Harusindan also had a sister who married a Dailamite nobleman named Ziyar, and together they had a son named Mardavij, who would later create the Ziyarid dynasty. Mardavij then began aggressively expanding his territories, killing Asfar and capturing several important cities in Iran, such as Hamadan, Dinavar, Kashan, Isfahan, Shiraz  and Ahvaz from Abbasid. He further planned to restore the Sasanian Empire through conquering Baghdad and ousting the Abbasid Caliphate, but was instead murdered in 935. After Mardavij's death, his brother and general Vushmgir was crowned as the new Ziyarid ruler in Ray. Dinawar was a major city in the 8th-11th centuries, located to the northeast of Kermanshah in western Iran. The ruins of the city is now located in Dinavar District, in Sahneh County, Kermanshah Province. Hasan ibn Buya, one of the brothers of the Buyid ruler Ali ibn Buya, took advantage of Mardavij's death by seizing Isfahan from Ziyarid rule. The Samanids also took advantage of the opportunity, but were defeated by Vushmgir, who then wrested Gorgan from Samanid control. The Buyid dynasty or the Buyids, also known as Buwaihids, Bowayhids, Buyahids, or Buyyids, was a Shia Iranian dynasty of Daylamite origin. Coupled with the rise of other Iranian dynasties in the region, the approximate century of Buyid rule represents the period in Iranian history sometimes called the 'Iranian Intermezzo' since, after the Muslim conquest of Persia, it was an interlude between the rule of the Abbasid Caliphate and the Seljuk Empire. Gorgan is the capital city of Golestan Province, Iran. It lies approximately 400 km (250 mi) to the north east of Tehran, some 30 km (19 mi) away from the Caspian Sea. In the 2006 census; its population was 269,226, in 73,702 families. However, Vushmgir soon decided to acknowledge Samanid supremacy, and in 936 he also turned over Gorgan to Makan. Turning against Hasan, he retook Isfahan in 938. In 939 or 940 the Samanid governor Abu 'Ali Chaghani attacked Gorgan; Vushmgir sent Makan aid, but the city fell after a long siege. Abu 'Ali Chaghani then engaged Vushmgir in battle in Ray and defeated him, killing Makan in the process. Vushmgir fled to Tabaristan, but was faced there with a revolt by his governor of Sari, al-Hasan ibn al-Fairuzan, who was a cousin of Makan and blamed the Ziyarid for his death. Vushmgir defeated him, but al-Hasan convinced Abu 'Ali Chaghani to invade Tabaristan. Vushmgir was forced to recognize Samanid authority again. Hasan furthered the Ziyarid's troubles by retaking Isfahan in 940. Abu 'Ali Ahmad Chaghani was the Muhtajid ruler of Chaghaniyan (939–955) and governor of Samanid Khurasan. He was the son of Abu Bakr Muhammad. Al-Hasan ibn al-Fairuzan was a Daylamite prince from the Firuzanid family. When Abu 'Ali Chaghani left for Samanid Khurasan, Vushmgir retook control of Ray. He then lost it for good in 943, to the Buyid Hasan. Returning to Tabaristan, he was defeated there by al-Hasan, who had previously occupied Gorgan. Vushmgir fled to the Bavandids of the mountains in eastern Tabaristan, then to the court of the Samanid Nuh I. Al-Hasan meanwhile allied with Hasan, but when Ibn Muthaj took Ray from the Buyids in 945, he recognized Samanid authority. Still, in 945 Vushmgir captured Gorgan with Samanid support, but did not manage to retain his rule there. It was only in 947 when he was able to take Gorgan and Tabaristan from al-Hasan with the help of a large Samanid army. Due to his tyrannical rule, Qabus was in 1012 overthrown by his own army, and was succeeded by his son Manuchihr, who quickly recognized the sovereignty of Mahmud of Ghazni, and married one of his daughters. Manuchihr died in 1031, and was succeeded by his son Anushirvan Sharaf al-Ma'ali whom Mahmud of Ghazni had chosen as the heir of the Ziyarid dynasty. From 1032 to 1040, the real power behind the throne was held by Abu Kalijar ibn Vayhan, a relative of Anushirvan. In 1035, Abu Kalijar stopped paying tribute to the Ghaznavids; the Ghaznavids invaded Tabaristan and sacked the Ziyard capital, Amol. Abu Kalijar, after having learned the consequences of not paying tribute to the Ghaznavids, agreed to continue paying tribute. This gave Anushirvan the opportunity to imprison Abu Kalijar and gain a firm grip over his kingdom. In 1041/1042, the Seljuqs, now the new masters of Khorasan, invaded Anushirvan's domains, which forced him to accept their authority. Anushirvan died in 1059 and was succeeded by his cousin Keikavus, the celebrated author of the Qabus nama, a major work of Persian literature. Keikavus died in 1087, and was succeeded by his son Gilanshah. Gilanshah's reign, was, however, short; in 1090, the Nizari Ismaili state under Hassan-i Sabbah invaded and conquered his domains, which ended Ziyarid rule in Tabaristan. One of the most famous architectural works of Ziyarid dynasty is the Gonbad Kavous (meaning the "Dome of Qabus"). The tomb is one of the earliest architectural monuments with a dated inscription surviving in post-Islamic Iran. The tomb, built of fired brick, is an enormous cylinder capped by a conical roof. The circular plan, broken by 10 flanges, is 17 m in diameter, and the walls are 5.2 , thick. The height from base to tip is 49 m. Legend has it, that the body of Qabus was enclosed in a glass coffin which was suspended by chains from the interior dome inside the tower. Abu Salih Mansur was amir of the Samanids (961–976). He was the son of Nuh I. His reign was characterized by weak rule and perpetual financial troubles. Falak al-Ma'ali Manuchihr, better known as Manuchihr, was the ruler of the Ziyarids. He was the son of Qabus. Bisutun (بيستون) was the ruler of the Ziyarids (967–977). He was the eldest son of Vushmgir. Zahir al-Dawla Vushmgir, mostly known as Vushmgir, was the second Ziyarid Emir who ruled from 935 until his death in December 967. He was a son of Ziyar. Voshmgir means "quail catcher" in the local Caspian Iranian dialects. Qabus ibn Wushmagir (full name: Abol-Hasan Qābūs ibn Wušmagīr ibn Ziyar Sams al-maʿālī, ابوالحسن قابوس بن وشمگیر بن زیار, شمس المعالی; was the Ziyarid ruler of Gurgan and Tabaristan in medieval Iran. His father was Vushmgir and his mother was a daughter of the Bavandi Ispahbad Sharwin II. Anushirvan Sharaf al-Ma'ali was the ruler of the Ziyarids. He was the son of Manuchihr. Shahriyar II was the eleventh ruler of the Bavand dynasty from 930 to 964. He was the son and successor of Sharwin II. The Firuzanids (Perozanids) were an Iranian princely family of Daylamite origin which ruled Shukur, and at their greatest extent ruled all of Tabaristan. 1 2 The Ghaznavids, C.E. Bosworth, History of Civilizations of Central Asia, Vol.IV, part 1, ed. M.S. Asimov, C.E. Bosworth, (Motilal Banarsidass Publishers, 1997), 107. ↑ A. Christian Van Gorder, Christianity in Persia and the Status of Non-Muslims in Modern Iran, (Rowman & Littlefield, 2010), 81 n27. ↑ Madelung 1975, p. 212. ↑ Madelung 1975, p. 213. 1 2 "Ziyarids", C.E. Bosworth, Encyclopaedia Iranica, (October 1, 2010). ↑ "The Minor Dynasties of Northern Iran", C.E. Bosworth, The Cambridge History of Iran, Vol. 4, ed. W. Madelung, (Cambridge University Press, 1975), 214. ↑ "The Exact Sciences", E.S. Kennedy, The Cambridge History of Iran: The period from the Arab invasion to the Saljuqs, Vol. 4, 394. Edmund Bosworth, C. "ZIYARIDS". Encyclopaedia Iranica, Online Edition. Nazim, M. (1987). "Mākān b. Kākī". In Houtsma, Martijn Theodoor. E.J. Brill's first encyclopaedia of Islam, 1913–1936, Volume V: L–Moriscos. Leiden: BRILL. pp. 164–165. ISBN 90-04-08265-4. Busse, Heribert (1975). "Iran under the Būyids". In R.N. Frye. The Cambridge History of Iran, Volume 4: From the Arab Invasion to the Saljuqs. Cambridge: Cambridge University Press. pp. 250–304.